"Untold Story puts its focus on creating an incredible, dynamic story"
It's an exciting time to be a game developer, as modern technology and a more accessible industry allow people of all walks of life to try their hand at pursuing their passion. This is a win for gamers, too, as it allows us the opportunity to try all sorts of new experiences and clever riffs on old ones. Enter Untold Story, a new 8-bit JRPG from Candlelight Studios. Built using many of limitations of the NES and clearly inspired by the many RPGs that populated it, Untold Story aims to deliver that same retro experience, but with modern game design philosophies. It's a tough line to walk, but studio lead Josh Temblett seems sure that he can strike the right balance. We took some time to catch up with Josh and to talk with him about the development process, inspiration for his upcoming game and his hopes for its release. Thanks for taking the time to speak with us. Can you please introduce yourself to our readers and tell us a bit about yourself? My name is Joshua Temblett and I love making video games! I'm a solo game developer from England. I've created two games, Flying Home and The Empty Inn, which was recently released on Steam. 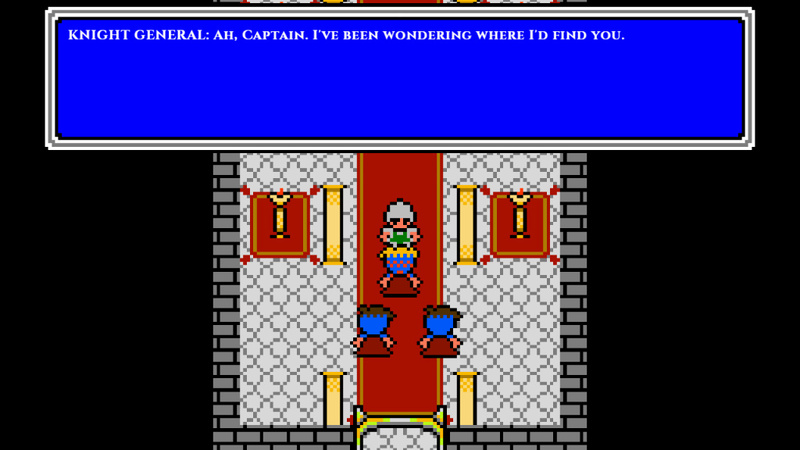 I am currently working on my third game, a NES-style RPG called Untold Story. Unlike my other games, which are fairly short and sweet, Untold Story aims to be the full package, providing tons of gameplay and story. I've played Nintendo games for much of my life, and I have a real passion for the franchises they've created. I personally believe that playing Nintendo games is one of the best things a developer can do, as their games are some of the finest around and one can learn so much from playing them. Let's start from square one, what inspired you to begin developing Untold Story? Ever since I played Final Fantasy IX, I've wanted to make video games ... more specifically games which tell a story. Final Fantasy IX made a connection with me on a very personal level and taught me that video games could create characters and worlds which the player could fully immerse themselves into. It was here where my love of RPGs grew. After playing Final Fantasy IX many, many years ago, I've wanted to make a game in the same vein as my favourite RPG whilst also creating a game which is my own personal take on the genre. After much learning, and gaining plenty of experience, I am now in a position to create my dream game, Untold Story. Using NES style graphics, as well as adopting some of the console's limitations, has made Untold Story's development manageable, enabling me to build the game I've always wanted to. Using NES style graphics, as well as adopting some of the console's limitations, has made Untold Story's development manageable. Using the art style of a NES RPG also enables me to pay tribute to the beginnings of the genre. What made you choose to pursue development alone and what kind of perks and challenges has that brought? I wanted to get into game development any way possible and being a solo game developer was the easiest way of doing that, especially considering I did not have the financial means to create a team which isn't overburdened by stress due to financial insecurity. I wanted to start with small games so that I could learn the ropes and how everything that makes up a game comes together. Now that I've completed The Empty Inn, I'm ready for something bigger … Untold Story. Untold Story's code, art and design is being done completely by myself, however due to the sheer scale of the game I've teamed up with a fantastic chip-tune composer, Ben Burnes, whose work I have long admired. Some of his music for Untold Story is in the gameplay teaser at the end of this interview; it's truly amazing work. If you're a fan of chip-tune music you're going to love this game's soundtrack. Overall being a solo developer is a challenge, but it's a fun one. It gives you complete control over every aspect of your game. However it can also be very tiring as it's all down to you; you don't have a team who can have your back. Retro-inspired Indie games are all the rage these days. What do you believe sets Untold Story apart from the rest? Untold Story is incredibly different to a lot of retro-inspired indie games, especially RPGs. Untold Story is about events, and about how the characters deal with the world as it evolves. A lot of games nowadays feature quite static worlds, especially in the game's genre, however Untold Story puts its focus on creating an incredible, dynamic story. Creating a cohesive and interesting story in a game is hard; however I'm not one to shy away from a challenge, which is why Untold Story is tackling it head on. That's not to say that gameplay is being put to the wayside. The battle system is fast paced, but also retains the style of the genre. There's a large focus on strategy, before battle and during, and I think a lot of players will thoroughly enjoy participating in fights. It's a quite unique system, and it's something which I'm very proud of. Whilst Untold Story has the looks of a retro game it's anything but, as it harnesses the innovation that fuels the indie scene. To sum it up: If you want a grand adventure, and to grow with the characters and the world, then Untold Story is your game. You recently rededicated yourself to finishing Untold Story after taking a brief break to pursue development of what was a side project, The Empty Inn. What have you learned from that and how do you think it will contribute to the development of Untold Story? The Empty Inn is a small, experimental, art game, which originally spawned from an idea around exploring a place which is supposed to be full of life, but has been recently made desolate; capturing the fleeting feeling of time and human movement. I originally wanted to use The Empty Inn as a game where I could test specific elements in Untold Story, such as the art style and level design, however it eventually morphed into its own thing. I've learnt a lot about what to do, and what not to do, and I'm very thankful for the feedback I've gotten from the game, all of which will go into making Untold Story a better game. Game developers get experience in different ways, depending on the environment they find themselves in. Some developers are lucky enough to get taken under another's wing, others learn as part of an experienced team or by releasing games to the public. Either way, a lot of developers will say that a developer's first commercial project is always a bit of an outlier. In The Empty Inn's case my learning and experience is very much out in the open. I'm incredibly proud of The Empty Inn. It proves that I have the tenacity to stick to a vision and follow it through to the end, even if the final product isn't exactly as I would have liked. Now I'm ready for something bigger and to take all of the experience I gained, which is incalculable, and put it into a dream project. I just need the space and time to make it. So, what's next for Candlelight Studios after Untold Story? Have you thought about any other genres or ideas you'd be interested in tackling next? Right now I'm fully focused on Untold Story and building the best game I can. Having said that, I do have a few ideas for what's next, and I've got a plan for how I would like Candlelight Studios to evolve and develop over the years. It's important to be flexible when it comes to making games though, so I have no doubt that these plans will change as opportunities present themselves. All I know is, I'm in video games to make actual video games … that I want to make video games I want to play. I also want to help push the industry forward artistically and creatively, whilst building a sustainable business which respects the artists working for it. You've previously stated that you'd be interested in releasing Untold Story for the Wii U, is this still being considered? Additionally, would you consider bringing The Empty Inn to Nintendo platforms? I would love nothing more than to bring Untold Story to the Wii U. Whilst I can't commit to anything right now; it is at the forefront of my mind. If I can get the funding I need, then I have every intention of releasing Untold Story on a Nintendo platform. With regards to The Empty Inn, right now, I have no plans to release it on Nintendo platforms. It's quite experimental and I would rather spend time on Untold Story and getting that on Nintendo platforms. Finally, what is your favorite JRPG (on Nintendo consoles) and why? The Wii exclusive, The Last Story is by far one of my favourite games (yet alone JRPGs). The Last Story has it all, great characters, a wonderfully paced adventure and innovative and entertaining gameplay. Hironobu Sakaguchi (the game's Director) really knows how to dig his hooks into gamers and I was personally semi-addicted to the game until I managed to complete it. Not a lot of games really grab me, but oh boy, did I fall in love with The Last Story. The Last Story was a throwback to the type's games I love and I enjoyed every single second of it. My hope is that Untold Story will be able to capture the same feeling. Any closing thoughts you'd like to share with our readers? Right now I'm currently looking for funding for Untold Story so that I can finally have the time and space I need to make the game. I wanted to take the opportunity and use this interview to show potential investors that there is a market for the type of game I'm making. Thus, the Untold Story playable teaser was born. The Untold Story Teaser is only a couple of minutes, and doesn't feature any battle gameplay, but I know that if I show your readers what I'm trying to achieve then they'll get excited. If you like the teaser and want to see the game get made then post comments on this thread, share it on social media and make a noise! Stamp your feet, make it known that you want to play this game! Every comment or social media share counts, and it will really help me in getting this game made and getting it onto Nintendo platforms! I know there are a lot of indie games available and Nintendo fans wish there were more larger games coming to their platform of choice, however I hope to deliver a very big game, in a very small package, and I know that with the support of Nintendo's fans this will more than possible. Please note the Untold Story Teaser does feature some flashing lights. PLEASE NOTE: The Untold Story Teaser should work in all browsers, however it works the least effectively in FireFox. Chrome is recommended for the best results. If you wish to play the Untold Story Teaser in a separate browser, please click here! We'd like to thank Joshua Temblett for his time. This works on mobile for some reason. I can't controll besides clicking but I can listen to the awesome music. EDIT: I retract my comment about the styling choice, as I read on their website that is what they were going for! As for releasing the game on Wii U, it needs a lot of polishing. The character walking animation for going up and down is missing a frame, the colours are as mentioned, but the music is fantastic and fits in quite well with the game. The font is very out of place and feels MUCH too small and 'modern' for the art style they are trying to go with. The character's movement pattern has an issue where if you walk up while walking left or right you end up strafing in an awkward fashion, which seems out of place for an RPG. I hope the developer sees this comment and can address some of these issues, and if they need another sprite artist to help them out I'd gladly do so, unpaid. I'm not a fantastic spriter but I do have several years of experience, especially in a retro scene like this. Hey guys! I'm Josh from the interview above! Thank you so much to Mitch for interviewing me, it was a real pleasure! If you have any questions then feel free to ask and I'll respond below! @amiiboacid The Untold Story Teaser doesn't work in mobile, it only works on PC as you need a keyboard and mouse to move around and interact with people. But I'm glad you're enjoying the music! I tend the teaser running whilst I work! @JoshuaTemblett I think you have a promising work here, but it needs some polish in my personal opinion. See my post above if you are interested in my criticisms, I'd love to see them addressed or a response about things that may have been intentional. Edit: I also apologize if I seemed overly harsh. Always on the look out for more rpgs! I would've liked a little bit of combat in the teaser, especially with the set-up for it on the train. @Chaotic_Eevee You weren't too harsh, it's fine! Besides, I love feedback and I appreciate you taking the time to share your opinions! Untold Story is still very much in deep development, so there's a lot which will change/be polished before it's eventual release. The reason why there might be a few issues with the character's movement is because I'm still polishing it and trying to get it right. I really wanted to move away from grid based movement, as I always found it a bit tedious to use... but a more "free-range" movement system is hard to get right, especially in a 2D RPG. With regards to the font, I'm still trying to find the right size. It's surprisingly hard to find a good middle ground. I quite like the font, I know it's far beyond what a NES could produce, however I feel like the more modernized font style suits the game and it's "retro X modern" style. But the font may well change. Readability, and having a good font, is really important for a JRPG. I'm glad you enjoyed the music, and I'll look into the animation issues you pointed out. Sounds great, very well done to Josh. Looks gorgeous too! I'll be sure to check out The Empty Inn when I can. It has some overly harsh user reviews on Steam solely because of its playtime/length, but that really isn't something that concerns me. It's difficult to take up any kind of project by yourself, and is thus commendable. @Shire I can't give it all away just yet! But stay tuned as we hope to reveal some stuff about the new battle system soon™! Also, I personally love Lycus. He's actually based on a small, ginger cat called Ginger! @gordjscott Thank you for the exceptionally kind comment, I really appreciate it. I hope you enjoy The Empty Inn and thank you for your wonderful support. If I may offer a bit of constructive criticism as a career graphic/web designer: Trajan/Cinzel is a poor choice for paragraphs of text. It really works best when used sparingly or for headings. The mix of caps and small caps is hard to read and makes lengthy sections hard on the eyes. You'll want to chose a font with a tall x-height, preferably a humanist, sans-serif that was designed for screen use. You may lose a bit of style or flavor in using a simpler font, but readers will thank you! Even with a good chip-tune soundtrack, I am simply not into 8-bit RPG games very much. They usually have a hard time holding my attention, but maybe if I am lucky the promise of modern day gameplay will make me change my tune. Not really sure what to think of the game right now, but I always enjoy supporting smaller developers. I'll look forward to more information closer to its release. Even though I really never been that into 8 bit RPGs, if it includes some more modern gameplay then color me interested. I'll totally be down for a retro throwback to RPGs, especially since there is barely any that aren't nothing but a grind fest/text fest and try to take in the improves that many future RPGs made. Nice! Really loved the music! This looks pretty good, love me an old-school RPG! @JoshuaTemblett - This sounds awesome! While I honestly prefer 16-bit era graphics to 8-bit, I can understand why it was chosen so the art of the game would be more manageable. That said, I feel like we have a very similar interest in RPG's; FF IX is indeed one of my favorite games as well, since the story is just so engrossing, a quality shared by my number one favorite Wii game, The Last Story. Just like you, I have some great ideas for RPG's with good storytelling, but I don't quite know where to start; I figured I could start developing some simple Android games since I know some Java first, but the learning curve for development just seems so high! Just curious, but how did you start developing games? Also, more on the topic, do you happen to have a KickStarter for this project? I feel like this is the type of project that would be excellent to support! It's not really much of a teaser without any combat. Anyway, this looks like it could be pretty promising. While I personally think retro-styled 2D games should have 16-bit quality graphics at the mininum without regard for the limitations of any system, I understand that this may be the best you can do on your own. As long as you follow through on your promise to include some more modern gameplay conveniences (any examples? ), then this is worth keeping an eye on. @Bassman_Q I'm glad I'm not the only one! If you enjoyed Final Fantasy IX and The Last Story, then you'll love Untold Story. As I said in the interview, I'm really trying to build upon Sakaguchi's style of storytelling and create a game with good story pacing and rich character development. @Chaoz Untold Story has no intention of being a grind-fest RPG. As the teaser shows, Untold Story isn't a game where you go into dungeons and grind for hours on end. The character-based storytelling is very much woven into the gameplay. This means that even if you don't like 8-bit graphics there is still a lot to enjoy and connect with. 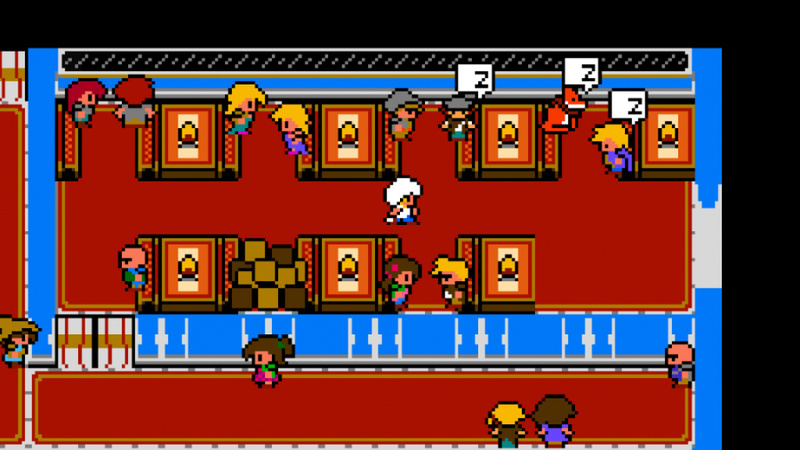 Also I'm not sticking to NES limitations (the train scene wouldn't be possible on an NES, especially with the level of detail in the characters), but rather using the art-style as a foundation and a way to surprise players with the more modern aspects of the game. So if 8-bit graphics aren't you thing then you're still in for a treat graphically as you'll be shown things which just couldn't be done at the time with the art-style. @Bassman_Q I'm considering loads of different funding options at the moment, I'm trying to find something which works well for Untold Story and it's fans. If people would support a Kickstarter, then please speak up as it'll make my decision a lot easier! @BulbasaurusRex It wouldn't be a teaser if it had combat, I want you to demand more . @Bassman_Q If you're interested in making RPGs, I would recommend using RPG Maker. The latest version, RPG Maker VX Ace, is very user friendly and some awesome games have been made with the program. @Bassman_Q As @Uzuki said, RPG Maker VX Ace is considered a good starting point if you're just interested in making JRPGs, although I can't personally attest to that because I've never used the engine. Untold Story, as well as my other 2D games, is made from scratch in Construct 2, a visual-programming based game engine. I personally find it a lot easier to use than raw programming the game, even though I do have programming knowledge. I actually have experience with Unreal Engine 3/4, and I come from a more 3D-focused background (I even made a short Star Wars 3D animation from scratch once! ), however I switched to 2D as it's far more manageable for a solo-developer. Well all I can really say is it looks interesting and good luck. I really do hope you accomplish the goal of making the world more dynamic, lot of people have talking about doing that and so far none really have. I definitely want to see more dynamic rpgs. @JoshuaTemblett and @Uzuki - Thanks for the replies! I'll check out what RPG Maker VX Ace and Construct 2 have to offer; I'll hold out for a Steam deal on the former if I decide to get it! @Bassman_Q If you do let me know. My profile links to my RM profile and I can answer any questions you have for the program. I played the teaser & it seemed really interesting. I want to play more, hope it arrives on the Wii U or NX one day. Or 3DS, that would be a good fit too, with bigger text of course. great work so far Joshua. Definitely looking forward to playing this! 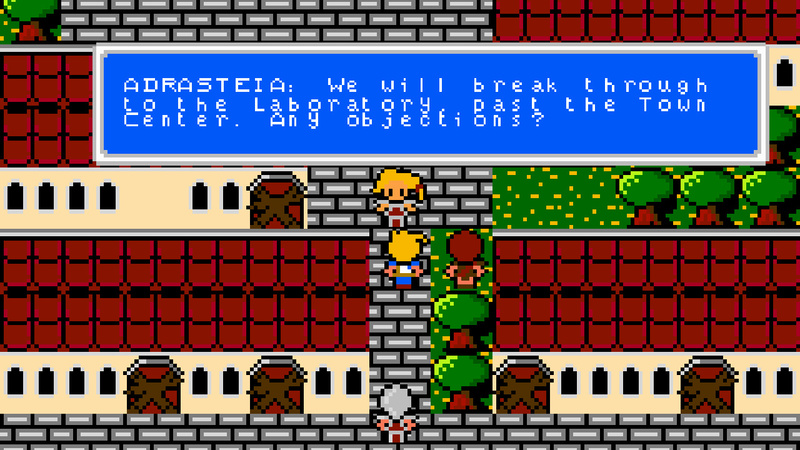 "A new 8-Bit JRPG..." English developer. So, not a JRPG, then. Got it. This honestly does seem kinda interesting. @WiiLovePeace @arrmixer Thank you for the kind words! I'd love it put it on the 3DS (that's my most played console), as well as the NX, but I'll have to see what happens! PS: @WiiLovePeace I love Crystal Bearers! Anyway... Are you going to kickstarter this game? I have no idea if you would be successful or not or even how to calculate how much monies you'd need but if you do I'd prepurchase a 3DS copy of the game So I imagine/hope others would too.